Early Monday morning I woke to nurse my almost 5 week old. Half awake, I opened Facebook to read a nutrition article I had saved, but I didn’t even have a chance to click the link. I was immediately bombarded by pictures of flames. Never did I think it could be Santa Rosa. As I continued to read, the articles stated Sonoma County, listing some of the major highways that run along and through Santa Rosa, where I lived for nearly 9 years. Then I received a group message to my husband and I from my mother in law… She was with her son in law and grandkids. They had to evacuate her daughter’s home (who was out of town at the time), because fire was coming over the pasture. They were safe. In a panic, I continued to read the news that a fire had burned through numerous houses throughout northern Santa Rosa and it was 0% contained. I thought to myself, this couldn’t be possible, could it? So many questions filled my head. The next morning my husband and I spoke with my mother in law. She explained that the house alarm notified her and her son in law that they needed to evacuate. There was no time to pack their belongings or family treasures. Over the next week I monitored news reports, friends’ Facebook posts, and continued to check in with friends and family living in Santa Rosa. The devastation was unbelievable. How was this beautiful city, in the middle of wine country, going to recover from an immeasurable amount of destruction? 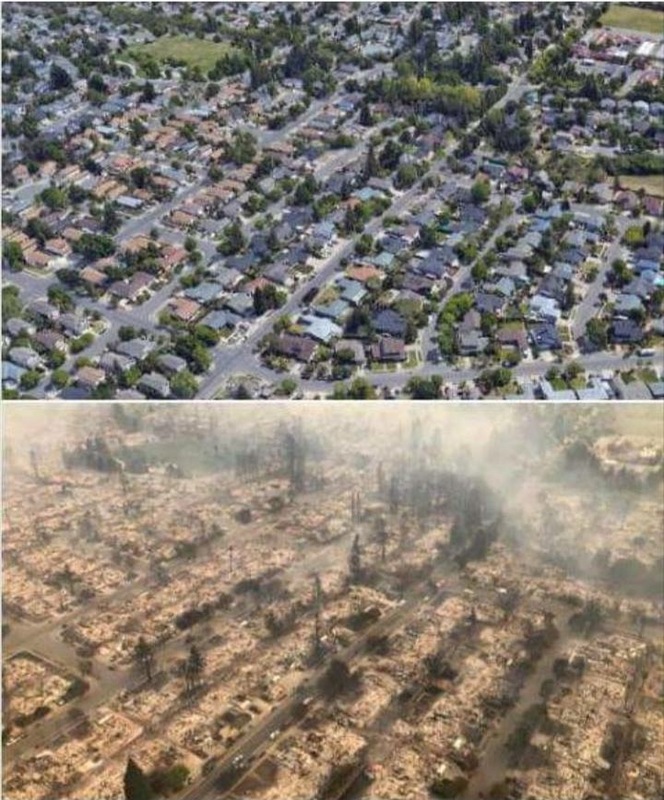 Fires continued to rage throughout the area forcing mandatory evacuations of various neighborhoods, while entire neighborhoods and nearby stores burned to the ground. At one time there was 17 fires accounted for, spreading across Napa, Sonoma and Mendocino counties. I’m not always the biggest advocate of technology and social media, ironic right? Yet this is one scenario where I consider Facebook to be a positive social outlet. It kept so many people connected and informed of the fire status. We wanted to assist as much as possible while we watched countless pictures of fire appear on the news and social media. However, from Nevada, all we could do is provide moral support to our family and friends by letting them know they had a place to escape to. We contemplated making the trip to Santa Rosa, but came to the conclusion that our presence would far from lessen the chaos, especially with wanting to avoid exposure to low air quality with a newborn and toddler. In fact, smoke is not the only concern. It is important that people realize there are unseen particles of burnt material traveling through the air. Plastics, toxic materials consisting of chemicals, metals and much more, so please consider this when you think the air is ‘clear’ over the next few days and even weeks to come. These toxins, although unseen, are detrimental to our health, and it is going to be just as important to detox and reduce this additional exposure to oxidative stress as time carries on. Unfortunately, humanity is far from perfect, as there were misled individuals that chose to take advantage of the situation by looting. My favorite response to this foul activity was from Annadel Estate Winery. Disastrously, the fire is still uncontained and unpredictable. Thousands of people continue to be displaced and the death toll on the rise. My heart weighs heavy as so many people I know sit on the edge of their seats hoping the wind strides in their favor, and many others converse with insurance adjusters over their destroyed homes and priceless possessions. 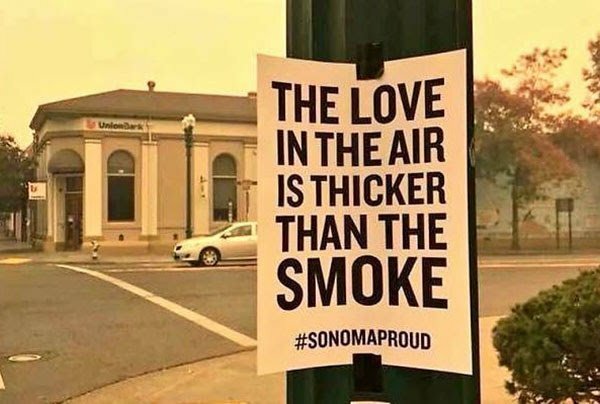 Please keep Northern California and Sonoma County in your prayers. If you can, please consider donating to this community, as so many homes were lost, businesses gone and schools were destroyed. Donate here. It’s going to be a long road ahead, but if anyone can pull through, it’s this community.